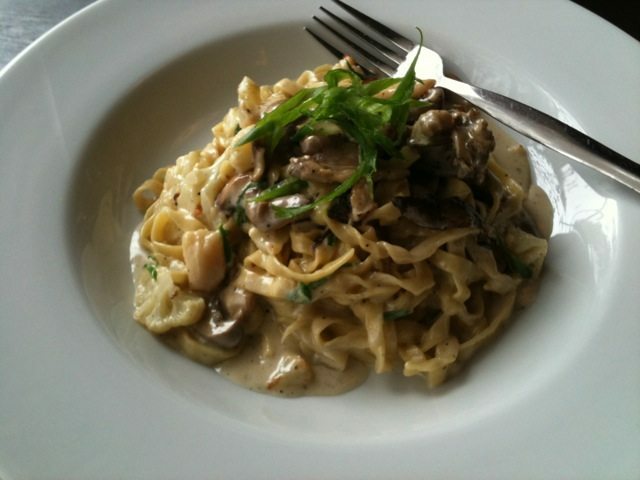 WEEKLY LUNCH PICK: Homemade pasta rolled out daily at Canvas Resto-Bar-Etc. The Place: A stone’s throw from Tunney’s Pasture and just steps off the Wellington West retail strip, Canvas is a welcoming sunny corner spot on Holland Ave. The fresh, something-for-everyone seasonal menu served in a cool, relaxed space makes this an ideal (yet seemingly overlooked) spot to unwind and refuel on a weekday afternoon. The Deal: Soup of the day can be a starter or a meal paired with a side salad perked up with goat cheese and nuts. Ten or eleven bucks buys your choice of sandwich or wrap (a club, pulled pork, or roasted veggies, for instance) or a fresh-to-order frittata whose adornments change daily. Everything comes with a choice of soup, salad or fries. The crisp sweet potato strings looked amazing but sadly the flavour of the root vegetable was lost in too much batter. The squash soup was a simple delight with bits of good quality bacon throughout. The Dish: The really special thing to order here is homemade pasta of the day. The chef (who, donning a white apron, emerged from the kitchen as our server as well) says he rolls out fresh pasta every morning. His gnocchi is apparently popular in the evening, but at a recent lunch I had the fresh tagliatelle with cauliflower and wild mushrooms in a white wine and cream sauce. The texture of the noodle was still firm and just right (thank you!!) and the overall dish was the kind of creamy comfort food that can change the tenor of a bad day (thanks again!!). The Cost: A fresh tuna salad Niçoise is $16, but most items are around $10. Canvas, 65 Holland Ave., 613-729-1991; lunch hours Mon-Fri., 11:30 a.m. to 2 p.m.